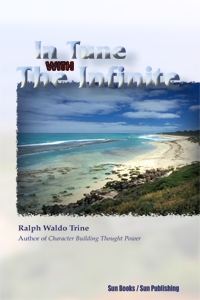 IN TUNE WITH THE INFINITE by Ralph Waldo Trine. A Message to My Readers, Prelude, The Supreme Fact of the Universe, The Supreme Fact of Human Life, Fullness of Life - Bodily Health and Vigor, The Secret Power and Effects of Love, Wisdom and Interior Illumination, The Realization of Perfect peace, Coming into Fullness of Power, Plenty of All Things - The Law of Prosperity, How Men Have Become Prophets, Seers, Sages, and Saviors, The Basic Principle of all Religions - The Universal Religion, Entering Now Into the Realization of the Highest Riches, Etc. 221 pgs. 5x8. Paperback. ISBN: 0-89540-387-0. (ISBN-13: 978-0-89540-387-2). $17.00.